Beeswax, like honey, is derived from the same flowers from which we gather our Branches varietal honey. Honeybees fly over 10 million miles and visit millions of flowers to produce 75 pounds of honey, and from all that work is derived only one pound of beeswax! 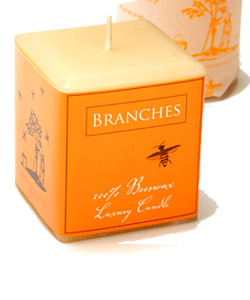 Our Branches 100% organic luxury candle is non-toxic emitting a sweet, subtle scent that will not overwhelm the senses. It is exceptionally long burning and dripless when kept out of a draft. Each candle is distinctive, reflecting the floral source from which it was gathered.